Hi guys, at present time billion of users must have to use latest technology smartphone. These smartphone developed by different mobile manufacturing companies which comes with latest features. Sometime, we lost our important data from our smartphone. Backup and restore process is different in different companies smartphone. Today we have to discuss how to take backup and restore Nokia smartphone. It is necessary for us to regularly take a backup of your all Contacts, SMS, Images and installed apps time to time. So here is a safe and easy step by step tutorial to take backup and restore Nokia smartphone. Take your smartphone backup regularly. There are lot of ways from which most of the users take backup and restore of Nokia smartphone. 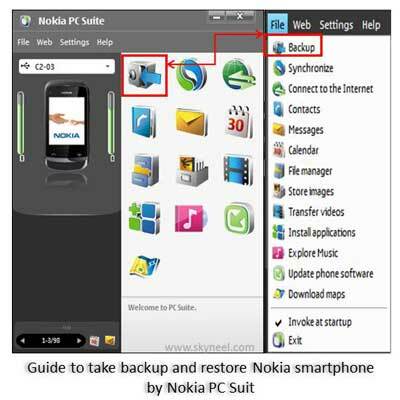 I recommend to use Nokia PC Suit to take backup and restore Nokia smartphone. It is the best and easy way. Nokia PC Suite allows you to easily connect any Nokia smartphone with the PC. It allows you to properly manager your smartphone on the PC by different applications. With the help of Nokia PC Suit you will be able to easily take backup, restore, synchronize, connect to internet, manage connects, sms, images, file manager, calendars, install any application, update phone software, download maps and many more. Step 1: Make sure your Nokia smartphone has enough battery. Step 2: Download and install Nokia PC Software in the Desktop Personal Computer or laptop. Step 3: Double click to turn on Nokia PC Suit software. Step 4: Connect your Nokia smartphone to your Desktop PC or Laptop via USB cable. During connecting via USB cable select Nokia Suite / Nokia Ovi Suite / PC Suit option in your Nokia smartphone. Step 5: To start backup of your Nokia smartphone click on the Backup button. Select the model of your phone which backup you want to take then click Next button. Step 6: Select the contents which backup you want to take like images, contacts, messages, calendars, bookmark etc. Now, click on the Next button. Step 7: Set the destination where you want to keep safe of your Nokia smartphone backup. After that click on the Next button. Step 8: Now, backup process is start. Don’t try to disconnect your phone or click cancel button otherwise backup will be lost. This backup process take some time. After finishing the backup process you will see an icon on your required destination. Step 1: Double click to open the Nokia PC Suit. Step 2: Connect your Nokia smartphone to your Desktop PC or Laptop via USB cable. During connecting via USB cable select Nokia Suite / Nokia Ovi Suit/ PC Suit option in your Nokia smartphone. Step 3: Select the option which you want to restore. Click on the File menu and choose import option. Step 4: Click on the Next button > Now, click on the Start button to start the restore process. I hope you like this article.After reading this article you will easily take backup and restore Nokia smartphone by Nokia PC Suit. Kindly share your knowledge with your friends, family members and others. Thanks to all.